Competent drilling of micro holes down to1/64" (0.5 mm). Three spindle speeds by shifting the flat belt for more than the triple torque in the lower rotational speed range. Optional Machine Vice MS 4 (see below). The unit comes with six triple slit MICROMOT precision steel collets. With extremely high rotational accuracy and optimal power transmission via belt drive for three different speeds. The unit offers a high quality machined work table of ribbed die-cast aluminum (work table size 8 1/2" x 4 3/4" (220 x 120mm)) providing an adjustable parallel fence with scale. The solid, hard-chromed steel column is 11" high (280mm) and has a diameter of 4/5" (20mm). The powerful motor, which is built into the super stable die-cast head of the machine, runs very quiet and has a long life expectancy. The power transmission by 3-step aluminum pulleys and flat belt provides 3 spindle speeds of 1,800, 4,700 and 8,500rpm allowing triple torque at lower speeds. The chrome feed lever has a practical adjustable drilling depth gauge. The spindle is essentially free of play as a result of the three high quality ball bearing assemblies. It is recessed for the insertion of MICROMOT steel collets, but also threaded for attaching drill chucks with 3/8" thread. The spindle has an extremely high rotational accuracy and a 1 3/16" (30mm) feed. The quill diameter is 1 1/4" (32mm) with return spring, the throat depth (column to drill spindle) is 5 1/2" (140mm). The unit provides quick coarse height adjustment of the headstock via clamp lever. The max. 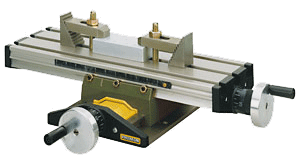 height (worktable surface to spindle end) is 5 1/2" 140mm). 110 - 120V, 60Hz, 85W (0.115hp), speeds 1,800/ 4,700/8,500rpm. The unit comes with six triple slit MICROMOT precision steel collets in sizes 1/32", 1/16", 5/64", 3/32", 7/64" and 1/8" (1.0, 1.5, 2.0, 2.4, 3.0 and 3.2mm). To clamp work pieces we recommend using either one of our machine vises or the X-Y table KT 70 to convert this machine into a high-precision machining center. Chuck for drill bits up to 1/4"
For drill shank sizes from 1/64" to 1/4" (0.5 to 6.5mm) and maximum speeds up to 10,000rpm this chuck offers industrial quality with extra high-speed accuracy. With 3/8" thread. For MICROMOT Bench Drill Press TBM 115. Including chuck key. Die-cast zinc. With three machined sides. The slot fits the adjustable fence of the drill stand MB 140/S, the drill stand MB 200 and the bench drill press TBM 115. Horizontal and vertical V-slots in jaw. Jaw width 2" (50mm) and height 2/5" (10mm). Maximum clamping width 1 11/32" (34mm). For precise milling, boring, drilling or grinding operations as well as positioning. 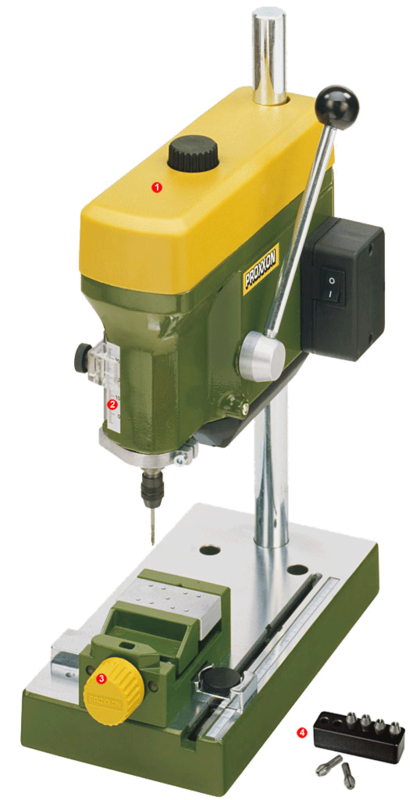 This high-precision cross slide table is the optimal attachment when working with the MICROMOT Drill Stands MB 140/S and MB 200, the Bench Drill Machine TBM 115 or the Machine Vice MS 4. Clamping accessories for easy attachment on or below the above items come with the table. 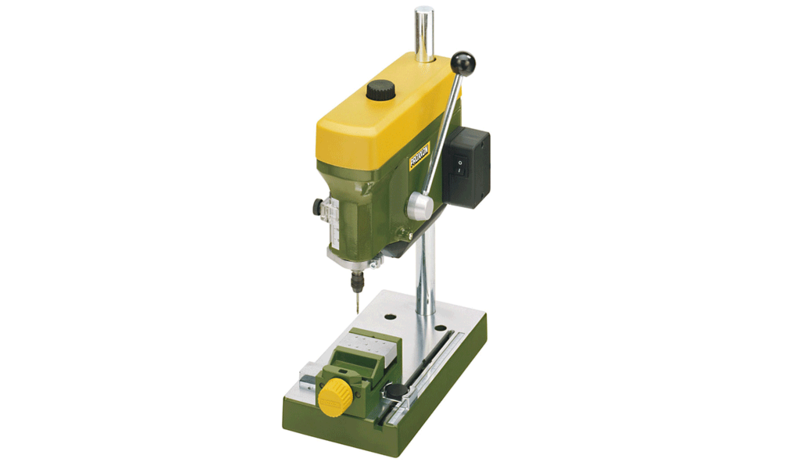 Of course, the table can also be used with other Drill Stands or Drill Presses. The table is made from surface-treated aluminum, has three longitudinal T-slots and provides dual axes (lateral & cross) positioning via two hand wheels. The hand wheels have zero-resettable dials graduated in 0,05mm increments (1 complete revolution of the hand wheel = 1.0mm, 1 pitch line = 0.05mm feed). One set of step clamps is included. Table size: 7 7/8" x 2 3/4" (200 x 70mm), with 3 T-slots in size 15/32" x 15/64" x 13/64" (12 x 6 x 5mm), distance from center-to-center 63/64" (25mm). X-travel 5 9/32” (134mm), Y-travel 1 13/16" (46mm). Overall height: 1 11/16" (43mm).